Your Mac is full of files, folders, and applications, and it’s always an annoyance to spend time looking for the items you need. 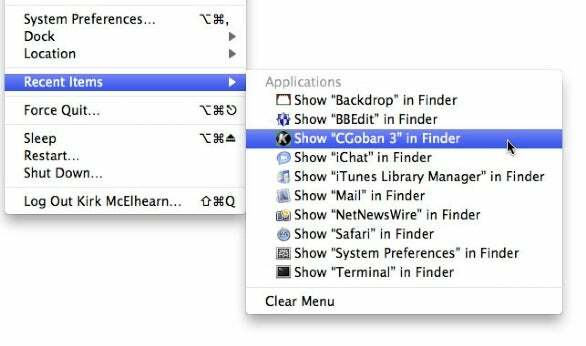 OS X offers many tools (for instance, the Dock and the Finder’s sidebar) that can help you access things you use day in and day out, but there are also a number of ways you can quickly get to items you’ve used only recently. Learning these techniques will streamline your work. The first way you can access recently used items is from the not-very-obvious Recent Items menu hidden in the Apple menu. Select Apple menu -> Recent Items and you’ll see a menu divided into three sections: Applications, Documents, and Servers. Your Mac records these items as you access them, so these menus constantly update. When you select a file or application it opens. When you select a server, it mounts and a new Finder window opens and pops to the front. Clear Recent Items If you ever want to reset this menu, select Clear Menu at its bottom. (Note that if you clear this menu, you will also clear the Recent Items menus in Apple applications, such as the iWork programs.) If clearing the whole menu seems too drastic, you do have some options. You can clear just one of the sections (see this OS X Hint for details). Or, if you’re feeling particularly picky, remove items from the menu individually, by editing a preferences file. Customize the number of items What if there are not enough items in the menu? By default, your Mac stores ten items in each category. If you want, say, more documents, fewer applications, and no servers, open System Preferences (Apple menu -> System Preferences), click on Appearance, and, in the Number Of Recent Items section, choose the numbers that suit you. Jump to an item in the Finder Sometimes, you may want to quickly find a recently used file to send to a friend or colleague. You could use Spotlight to search for it, but if you’re using Snow Leopard, instead try a trick with the Recent Items menu. Display that menu and then, while the menu is active, hold down the Command key. You’ll see each item change to a “Show In Finder” menu item. For example, myfile.doc will display as Show “myfile.com” In Finder. Choose that menu item, and a Finder window will open with the selected file highlighted. You can now copy it, attach it to an e-mail message, or do anything else you need with it. Need to find, rather than open, a file you used earlier? 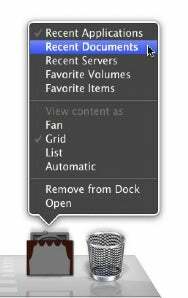 If you're using Snow Leopard, press the Command key while accessing the Recent Items menu to hop to the item in the Finder. In the Dock, you'll see a stack that shows your recent applications. Click on it to see the ten most recently used applications. Launch an item by clicking on it. Choose which type of recent items you want to display in your stack. If you’d rather see a different type of item in your stack, Control-click on the stack to reveal a contextual menu where you can choose from Recent Documents, Recent Servers, Favorite Volumes, or Favorite Items. Your Favorite Volumes are those in the Devices section of the Finder window sidebar. Favorite Items are the folders in the Places section of your sidebar. If you ever want to remove this stack from your Dock, just drag it off the Dock into oblivion. Sometimes it’s not even necessary to leave the program you’re in to find a recently used item. Find Office files In Microsoft Office applications, choose File -> Open Recent to see a menu of the last dozen files you’ve worked with in that program. If you still don’t see what you’re looking for, choose More from the bottom of the menu. This opens Office’s Project Gallery with the Recent tab selected. You’ll see a long list of documents you’ve used over time with each program. You can also go straight to the Project Gallery by choosing File -> Project Gallery or by pressing Command-Shift-P.
Find iWork files Apple’s iWork applications include recent item menus too. In Pages, Numbers, and Keynote choose File -> Open Recent. You’ll also find Open Recent popup menus in the programs’ Template Choosers or Theme Chooser. Make the Template or Theme Chooser open automatically for these programs by choosing this option in the program’s General preferences, under For New Documents. Find other program’s files Adobe Photoshop, Barebones BBEdit, and Apple Preview also have Recent Items menus under their File menus. This feature is so common, in fact, that it’s always a good idea to check the File menu of the programs you work with most.